When temperatures regularly drop below freezing, we usually see heavy service demand in the areas we serve. 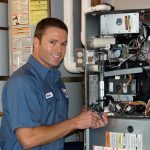 To keep your home warm and cozy (without resorting to calling a professional) we have listed a few things you should do to keep your home's plumbing and heating systems working when you need them most. As water freezes it expands which leads to burst pipes and expensive water damage. The best protection is to ensure all lines are insulated. As a reliable fail-safe when temperatures drop below freezing, we recommend leaving one faucet on so that a drip leaves the faucet every second or so. This simple step keeps water moving and will prevent freezing from occurring. Ensure outdoor hoses are disconnected and install insulated hose bibs over your faucets which you can acquire at your local hardware store. Condensate lines for high efficiency furnaces, tankless water heaters, boilers, and heat pumps. One of the most common heating system failures during freezing temperatures is when a condensate line freezes and doesn’t allow water to leave the system. You can tell if your system is high efficiency if the venting material is PVC. If your furnace vents in metal then it does not condensate. During freezing temperatures, periodically check the condensate line (pictured) to ensure it is draining properly and not freezing. If you notice that it is frozen, take a bowl of hot water and pour it over the exterior termination of condensate line. Another strategy is to use a hair dryer to warm the line. Use caution with an electric appliance around water. Heat until all ice is gone and keep an eye on it until temperatures warm up. Your system will be working hard over the next few days. Restricted airflow from dirty filters is a common failure in both freezing and non-freezing weather. 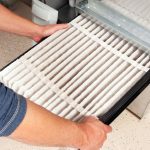 If your furnace filter is dirty, change the filter immediately. During these cold snaps, our service team is working around the clock to keep our homeowners warm and safe. This very high demand can lead to delays in service and long hours for our service team. 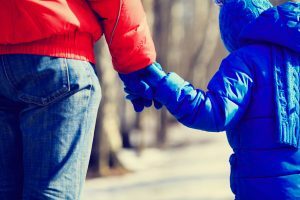 These simple tips will help you keep your home safe and your family warm. As your home partner, we hate having to charge a service call for a very preventable issue—so don’t let it happen to you! Learn about sales and special offers before anyone else, plus get tips and tricks that keep your home comfortable and energy efficient.